Live your day with more energy and fewer aches! Why Sore Necks & Tension Headaches? Just about all of us will experience short-term or chronic neck discomfort and headaches during our lives. The causes vary – a poor mattress, incorrect posture, muscle tension, sudden movements or stress. Most neck and headache tension from daily living is preventable and manageable. For intense aches resulting from accidents or serious injury, you should seek medical care immediately. You get up in the morning in discomfort. You struggle to earn your living in discomfort. And, sleep does not come easily since you are in discomfort. You dream of completing daily tasks without added difficulty. You dream of fully enjoying any activity you chose to do. You dream of living in the moment and not preoccupied with discomfort. The most common cause of neck discomfort is an injury to the soft tissues including the muscles, tendons, and ligaments. Discomfort located in the neck is a common medical condition. Neck discomfort is also referred to as cervical discomfort. Discomfort is commonly associated with dull aching. Sometimes discomfort in the neck is worsened with movement of the neck. Other symptoms associated with some forms of neck discomfort include numbness, tingling, tenderness, sharp shooting, fullness, difficulty swallowing, pulsations, swishing sounds in the head, dizziness or lightheadedness, and gland swelling. A stiff neck or shoulder and loss of range of motion. Sharp, dull, burning, crampy, shock-like, or stabbing discomfort. Weakness and severe discomfort from muscle or bone movement. Sensations similar to having your arm fall asleep. Additionally, symptoms may include the inability to feel things normally due to pinched, bruised, or cut nerves; coolness or color changes from arteries, veins, or both have been injured or blocked; as well as swelling, muscle spasms or tightness. You know it’s time for action. You yearn for the days when you had boundless energy and no discomfort. What if you bounced out of bed in the morning ready to embrace the day? What if you participated in any hobby and sport of your choice? Imagining the possibilities of a good-feeling life is great. Yet, an action is required to achieve this result. Let’s explore the available options, so that you can choose the option that is best for you. Neck Exercises & Stretching: Exercises from a physical therapist that you can do at home may ease discomfort; restore muscle function, and increasing the strength and endurance of your neck muscles. Your doctor may prescribe stronger pain medicine or anti-inflammatory medications than what you can get over-the-counter. Opioid analgesics, muscle relaxants, tramadol (Ultram) or tricyclic antidepressant medications are often prescribed for neck discomfort. Pain Medications: Doctors often recommend over-the-counter pain relievers such as aspirin, acetaminophen, and other NSAIDs. These provide relief for most people with tension-type headaches. Other Combinations: Aspirin or acetaminophen or both are often combined with caffeine or a sedative drug in a single medication. Other Medications: For people who experience both migraines and episodic tension headaches, a triptan can effectively relieve the discomfort of both headaches. 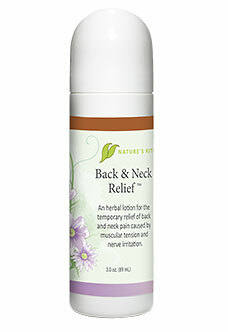 Nature’s Rite Back & Neck Relief™ is an all-natural roll-on lotion. Great for tension headaches, too! Our discomfort solution is an easy-to-use, no mess, and a cost-effective product! Your neck discomfort and tension headaches can literally disappear! Cramp Bark, Lavender Bud, and Peppermint – to aid in the relaxation of the skeletal muscles that cause back and neck discomfort. John’s Wort – supports the muscles to quiet over-active and irritated nerves to reduce discomfort signals. Arnica Montana and White Willow – act as analgesics to help the body to reduce discomfort. Comfrey and Arnica – support tissue repair. All you have to do is apply the lotion liberally over the pained area! That’s it!!! Nature’s Rite Back & Neck Relief™ is an all-natural roll-on lotion!! Our discomfort solution is an easy-to-use, no mess, it won’t leave you smelly or greasy and it is a cost-effective product!